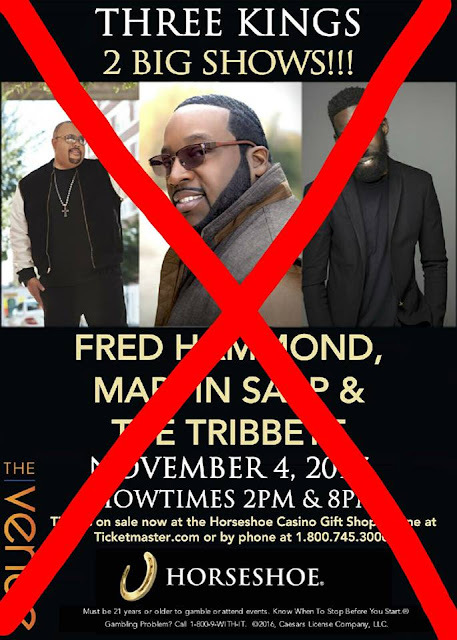 Why Did Gospel Great Tye Tribbett Back Out Of Tonight's Casino Concert With Fred Hammond and Marvin Sapp?? It was our desire that TYE Tribbett would be there to worship with you 11/4 but due to the decisions of the organizers/promoters of this event, we were unable to do so. We made every attempt to fulfill this ministry assignment but the circumstances surrounding our participation were beyond our control and the Organizers were not responsive in trying to ensure our attendance. Any concerns regarding refunds for ticket sales and etc should be directed to the contact information listed on the flyer. We look forward to the opportunity to share in worship with you in the near future. We love you INDIANA/ILLINOIS! !